Communists say Trump supporters are racists. Liberals say MAGA caps represent racism in their minds and “triggers” them to an emotional response to fight them. Well, the Hijab “triggers” Christians because it represents the slavery of women to Moslem men. It evokes an emotional response in Christians to fight against the evils of Islam. So, what is the difference between the responses to these two claims? One is a fictional creation of the leftwing media and the other is fourteen hundred years of history. Making America great in liberal minds means returning America to the days of slavery of blacks. How do they come to this conclusion? Through their delusional beliefs in fake facts such as the KKK being Republican. How do Christians come to the conclusion that the hijab represents the slavery of women in Islam? Because Muhammad said so in his commands to Moslems as written in the Koran. A liberal would ask, how is it then that Moslem women stand up to men in America? The answer is simply because Islam has a class structure in which non-Moslems are third-class citizens, so the second-class females can scorn them as they wish, while they must submit to the commands and beatings by the first-class citizen Moslem men. How many liberals on reading this statement do you think made their heads explode? Liberals don’t believe the truth. They believe in the lies that are created for them. They believe the false facts that are indoctrinated into their thoughtless mentality. Just look at Twitter when the picture was published of the Nicholas Sandmann being assaulted by a Democrat activist. The hate and violent reaction evoked because he wore a cap honoring President Trump was vicious, vile, twisted, and disgusting to behold. These hateful, petty, abominable people are the ones who claim to be the higher moral authority in America. How warped must their minds be to believe their bigotry is justified? Leftwing media reported that the “racist Covington Catholic school haters” denied a student from making a graduation speech because he was gay. As they always do, liberals present a lie under the guise of “if it is true” and don’t bother to do one minute of journalism to verify the facts. Every story reported by the leftist media is not journalism, but propaganda meant to indoctrinate rather than educate. Only unthinking liberals follow them just as the rats followed the Pied Piper. The left led them by the nose as they interviewed young Nick who respectfully told Savannah Guthrie he did nothing wrong, while she allowed Nathan Phillips who assaulted the boy to lie with impunity. The problem with social media from the beginning has been anonymity and the ability to speak outside of social constraints. Twitter amplifies anger, bad behavior, and stupidity, while at the same time they censor righteousness and the truth. This deliberate promotion of wickedness lies at the heart of leftist propaganda. Leftwing media cannot allow the truth to be told or they would lose their authority to dictate morality according to their ideology. The left reports falsehoods under the guise of journalism to give themselves credibility. But journalism died as the left became Democrat propagandists. Instead of reporting the facts, they report rumor and innuendo as banner headlines. When the facts come out disproving them, they post their retractions at the back of the obituaries. They use ambiguous words like “it may be,” “it’s possible,” or “it could happen” to sell their bogus theories. What percentage of fools believe the world is soon going to end due to global warming? What percentage believe Trump is guilty of some crime involving Russia? Forty years ago, we laughed at such poppycock. Now that 40% of the country believes such frauds it is no longer a laughing matter. The reality of Islamic jihadi terrorism is only compounded liberalism’s denial of the truth. The world is in flames because of Islamists inflicting terror attacks around the globe while leftwing socialists sympathize with them. Sharia Islam is the oldest cult of slavery left in the world and the left is promoting it to overthrow Christianity. 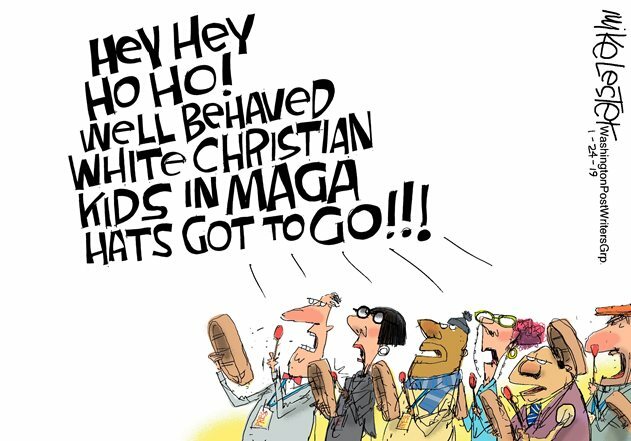 Christians may have had their problems with corruption in the past – the Catholic Spanish Inquisition, Southern Baptists supporting slavery – but that doesn’t excuse the left for their slanders. They portray Hitler as a Christian and the right as Nazis as if Jesus founded Nazism. As in all things, leftists slander the righteous with a broad brush for the sins of a few while excusing their own crimes. America is in turmoil because Democrats and their media cultists are brainwashing ignorant people into believing what are always revealed to be obvious lies on the least examination. The problem is in an uneducated public that is too distracted with their social media and entertainment to pay attention to the realities of their government. They hear Pelosi say Trump is a racist and she won’t give him but one brick for the wall to secure American’s safety and think that she is justified. If you confront a liberal about their beliefs, they will immediately retreat under the claim you are invading their safe space and threatening them, and they come up with different ways to say this. Of course, if you debate the liberal on the truth then you are threatening them to expose them as stupid fools believing frauds. They want to be able to tell you that you are wrong without making their case because they know they are vacant minded. They call truth “hate speech” while they spew their vicious bile. Liberals are willingly cutting their own throats to appease the forces of evil in the world – and the left is thanking them.